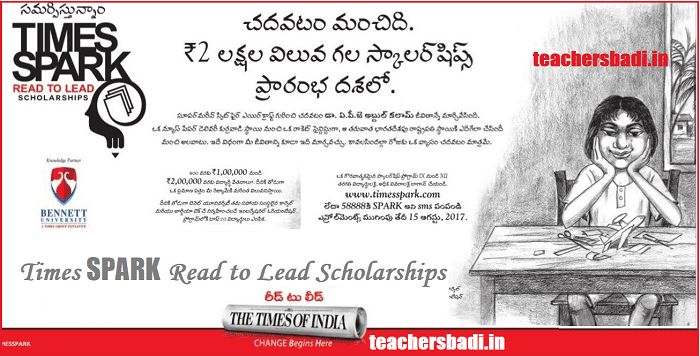 Times SPARK Read to Lead Scholarships 2017-2018, Online Registration form @ timesspark.com: TIMES SPARK Read to Lead Scholarships Program - SPARK: Times SPARK is a scholarship under our READ TO LEAD programme. SPARK stands for Scholarship Programme for Awareness, Responsibility and Knowledge. This is an endeavour to encourage school students of class IX to XII to develop a reading habit that helps them understand about our society and environment, so that they can go on to write the future. The Times of India will carry ONE article per day across a range of fields like current affairs, science & technology, sports, politics, social issues, global developments etc. Over a span of 3 months , these articles will provide multi-dimensional perspectives to help you get a deeper understanding of various interesting subjects. At the end, there would be an online test followed by an interview to assess your understanding & perspectives. After the final assessment at the end of 3 months, up to 400 students will get an educational grant ranging from Rs. 1 lakh to Rs. 2 lakhs. For the top 20, Bennett University will organize a special orientation program with its partner institutions - Cornell and Georgia Tech. The program is free for all. No registration fee. For Students: After the final assessment at the end of 3 months, up to 400 students will get an educational grant ranging from Rs. 1 lakh to Rs. 2 lakhs. For the top 20, Bennett University will organize a special orientation program with its partner institutions - Cornell and Georgia Tech. For Schools: The top 5 schools of each city based on the number of their students enrolled for the program, will get featured in The Times of India. 1. Only school students currently in grades between 9th-12th. 2. It’s a scholarship test which should be taken individually. 3. No need to upload any documents. 5. You will get a confirmation email/SMS. 6. No change your details after registering. Since your email ID will become your user name. why is'nt your forms shown even after downloading it?we wanna fill it.